Located at the tip of the Thumb, less than a mile from the sandy beaches of Saginaw Bay, Huron Nature Center Wilderness Arboretum is a 280-acre oasis of woods and wetlands in an area of the state known mostly for sugar beets and navy beans. A portion of the land has been owned by the county since 1941 and always jealously guarded by the local chapter of the Federation of Women's Clubs. During a half century of stewardship, the Federation called the original 120 acres a "Wilderness Arboretum" and vigorously opposed all proposals and attempts to develop the area. Strip malls, trailer parks and navy beans be dammed. The tract was too rare to let farmers plow it or developers attack it with bulldozers. In 1990, the Huron County Board of Commissioners enlarge the preserve to its present acreage, renamed it and developed a master plan for it. Since then a two-mile trail system has been built, benches and an interpretive building added, bridges and boardwalks extended through the wetlands and a parking area developed off of Loosemore Road. The Nature Center's unique terrain of sand dunes and shallow swales is a result of Lake Huron and the other Great Lakes receding from historically high levels more than 12,000 years ago. The wooded ridges are dry with poor sandy soil; many of the swales are wet and it's this wide variety of moisture levels that allows for such a diversity of plants and animals in a relatively small tract. Wildlife ranges from hawks, great-crested flycatchers and rose-breasted grosbeaks to deer, red-tail foxes and other small mammals. Birders are attracted to the preserve for its spring warbler migration. The nature center’s trail system totals less than 2 miles but snakes atop dry, gently rolling dune ridges and down into the shallow wet swales. You keep your feet dry as the trails are lined with boardwalks, benches, bridges and viewing decks while one short loop is a paved handicapped accessible trail. Fall colors are impressive in the park but May is by far the best time to hike the trails to enjoy the abundance of wildflowers and orchids. Though limited in mileage, the Huron County Nature Center makes for a pleasant hike along a system of paved and wood trails through what would otherwise be a wet woods. 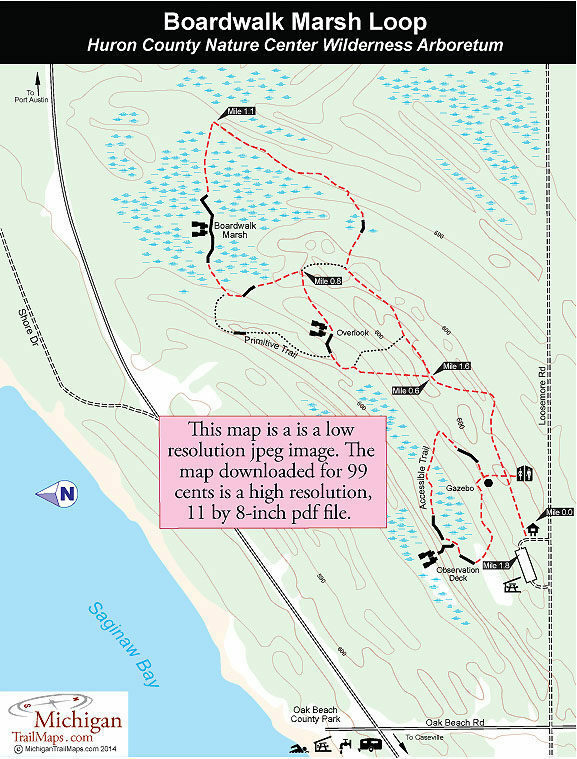 The paved Handicapped Accessible Trail makes for a half mile walk from the parking lot while this route, combining almost every trail, is still only a 1.82-mile hike including backtracking the final quarter mile. From the parking lot head east at the well marked trailhead to quickly reach the Handicapped Accessible Trail. The loop is 0.37 mile long and leads you through the unique dry swale and ridge forest habitat and over three boardwalks. A short boardwalk detour ends at an observation deck overlooking an interdunal wetland. Beyond the paved loop, wood chip trails continue east and within a few hundred yards the trail split. By heading left, you’ll reach another wetland observation area just beyond the junction with the Primitive Trail. The trail then swings north and in less than a mile from the trailhead you arrive at the longest boardwalk of the hike. Labeled Boardwalk Marsh, this one crosses a large marsh with a patch of open water. There is a bench in the middle of the boardwalk where you can sit and study the wildflowers, search for birdlife and - if traffic is not too heavy on M-25 - close your eyes and listen to the wilderness. Mile 1.1 of this hike the trail takes a sharp swing south, where a bench has been set up, to begin the return to the parking lot. In less than a half mile you arrive at the first junction of the day and are now less than a quarter mile from where you left your vehicle. The Huron County Nature Center features a pavilion, restrooms and 2500-square foot education/interpretive building with a gift shop that is open during the summer. Camping is not allowed but overlooking Saginaw Bay nearby is Oak Beach County Park. The 46-acre county park has a modern campground, swimming beach and picnic area. 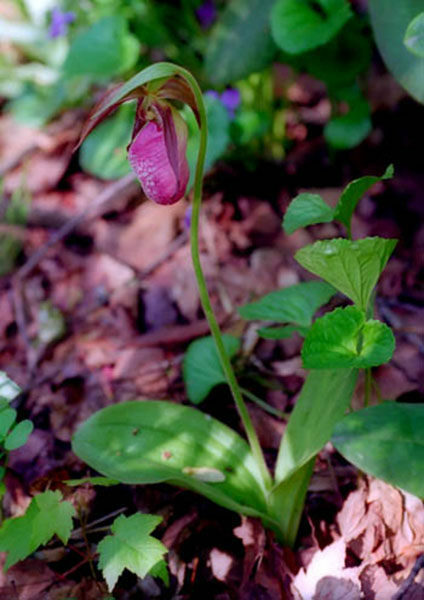 The center offers educational programs and events throughout the year, including the annual Lady’s Slipper Festival over Memorial Day weekend and special Saturday programs in the summer. There are no entry fees. To reach the Huron Nature Center, head east of Caseville on M-25 for 9 miles and then turn south of Oak Beach Road for a block and east on Loosemore Road. From Port Austin Oak Beach Road is 9 miles to the west. 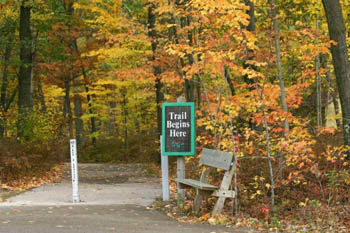 Check the Hurton County Nature Center web site (www.huronnaturecenter.org) or call the center office at 989-551-8400.